Pretty good stuff, no? The girl has an excellent voice that is drenched in this moody folk meets gothic style. Here’s the scoop: Karen is a supermodel of significant notoriety (if you follow that world) but she has long been a singer/songwriter, using the guitar as her writing tool. The arts must be in her genes as her twin sister, Kate, is a film maker in her own right. Plus, it’s not like fashion isn’t a creative field. Sure the models tend not to contribute artistically but they need to “get it” as they are a large part of the atmospherics that collectively create a designer’s show. This gig in The Citizens Band led to collaborations and supporting work with Robert Plant and Cat Power. But that’s not what produced this great great collection of material. Actually, it’s not what but who produced the work that is most responsible for inspiring her to take it to this new level. I casually mentioned earlier that Jack White was invloved but I purposely left out the details as I find this to be one of the more interesting parts of the backstory. Jack is just her producer, he’s her husband. Karen and Jack met while filming the music video for The White Stripes’ video “Blue Orchid”. The video’s director, Floria Sigismondi, remarked that “you could sense the energy between them.” They married within the year and now have two kids together. An odd side note: They had a remote wedding on the Amazon River in Brazil where White Stripes manager Ian Montone was the best man and Jack’s ex-wife, Meg White, was Karen’s maid of honor. Anyway, while living happily ever after in their Nashville home Jack found Karen “hiding” away scrolling out these songs. He eventually persuaded her to show him what she had been working on and he was blown away with what he heard. With some more encouragement, she wrote a few more and, like that, the album was born. This past week PBS aired a special entitled: The Library of Congress Gershwin Prize for Popular Song In Performance at the White House. It’s a real mouthful but then again, titles were never exactly PBS’ strong suit. The honoree this year was none-other-than Sir Paul McCartney, which should come as no surprise given the man is (literally) the most successful songwriter of all time. There were 2 stats that popped up during the presentation that were pretty astonishing to me. The first was that nearly 200 of his songs reached the charts. The second was more surprising, collectively these songs have spent a total of 32 years on the charts… 32 years! The special itself was pretty cool. 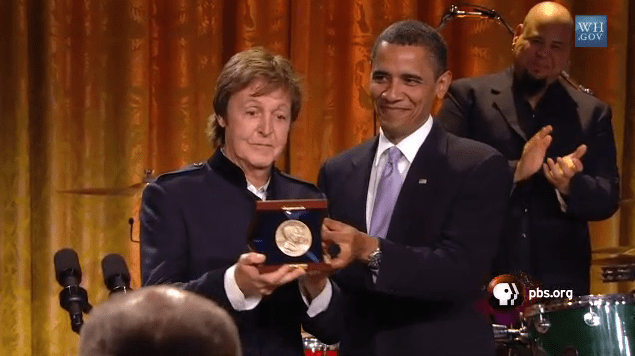 It included some performances by Paul, some brief MC work from Jerry Seinfeld, numerous guest performances by other artist who honored Paul by covering his material and, of course, the President presenting Paul with his award. The whole thing can be watched in it’s entirety on the PBS website, which you can find a link to in the ‘references’ section at the bottom of this post. For a quick sneak peek you can find a few of my favorite moments right below. Here is Jack White performing a great version of the Lennon/McCartney tune “Mother Nature’s Son” from The Beatles (The White Album). Here is Stevie Wonder doing his amazing cover of yet another Lennon/McCartney collaboration, “We Can Work It Out”. This tune is on Stevie’s album Signed, Sealed, Delivered and in my opinion stands as one of the best interpretations of another artist’s song I’ve ever heard. It does what every cover is intended to do. It honors the original while putting a very unique (and in this case, compelling) spin on it. Eddie “Son” House Jr. is perhaps the father of the Delta Blues. Many say that it was Robert Johnson but in reality even Johnson was influenced by his predecessor, Son House. He even owes House for some of the folk lore and mystique that surrounds his legacy because it was House who spread the idea to young blues admirers that Robert Johnson had sold his soul to the devil in exchange for his musical prowess. The bottom line is, without Son House, there would likely be no Muddy Waters or Robert Johnson. The combination of House’s voice and guitar made his music unbelievably raw, sincere and just plain fascinating. It’s incredible… as is the back story behind the man himself. House was born in 1902 on a plantation on the Mississippi River Delta. Before the Civil War, Delta plantation owners had been major purchasers of human labor. After being liberated in 1865, the displaced former slaves maintained their musical and storytelling traditions, spirituality, endurance, and humor… all of which had a indisputable voice through the blues. Still, the music that emerged from these common beginnings was not embraced by all. The Delta blues belonged to only the poorest and most illiterate of folks. It only grew to “sophistication” on street corners and in the rowdy and often dangerous drinking places called juke joints. The performers were usually drifters who could find work anywhere during harvest time. But the most popular became local stars and often infamous as in House’s case. It was once said that the “Blues was so disreputable that even its staunchest devotees frequently found it prudent to disown it”. The church and the blues were not supposed to mix. This was an ethical dilemma that haunted Son House all of his life as he was a churchgoing man since a young boy. By the age of 15 House was giving sermons. By 20, he was the pastor of a Baptist church. Although he was passionate about his religion, House never committed to a career in the church. He rambled from job to job, picking cotton, gathering tree moss, always looking for “easy street”. Despite the fact that his father and his uncles had their own horn band, Son House never viewed music as a way to make a living. By 1926, after chasing a girl to Louisiana, House had returned home and was considering going back to the church. Around that time, while doing some rambling and drinking, House had seen a local bluesman named Willie Wilson play bottleneck guitar. He was dazzled. “This boy,” House remembered, “had a thing on his finger like a small medicine bottle, and he was zinging it, you know.” He recalled, “’Sounds good!’ I said. ‘Jesus, I like that! I believe I want to play one of them things.’” With just a buck and a half House went out and bought himself a battered old guitar. Wilson taught him how to tune by ear, another player, James McCoy, gave him lessons, and the rest he picked up on his own. But House’s distinctive style was not simply a product of his early influences like McCoy or blues great Charley Patton. His history with the church had a hand in it too. Blues Historian, Robert Palmer, noted that, “[House’s] instrument became a congregation, responding to his gravelly exhortation with clipped, percussive bass rhythms and the ecstatic whine of the slider in the treble…. It was stark, gripping, kinetic music that demanded to be danced to and would have left few listeners unmoved.” Son House was preaching the blues. In those days the Delta was Mississippi’s wild side, a blend of hard times, heavy drinking, and a gun in the possession of almost every man. In 1928, House was sent to a state penal farm for shooting and killing a man at a drunken house party near his home. House had pleaded self-defense as he was merely retaliating after the man opened fire in the confined space (hitting House in the leg). After serving two years, he was released and ordered not to return to the area ever again. And with that, he headed north. In Lula, Mississippi, he met his hero, Charley Patton, and the two became as close as brothers. House, Patton, and a lesser-known local bluesman named Willie Brown teamed up for gigs and enjoyed some small-time success. In 1930, representatives of Paramount Records ventured to Lula to invite Patton to Wisconsin for a recording session. Patton brought along Son House, Willie Brown, and blues singer and piano player Louise Johnson. The resultant recordings have become classics, and Son House’s “My Black Mama” and “Preachin’ the Blues” are considered masterpieces of Delta blues singing. Patton died in 1933. House married, earned a meager living driving a tractor, and continued playing with Brown. Along the way, House taught his classic “My Black Mama” riff to future blues titans Robert Johnson and Muddy Waters. In 1942, House recorded “Walking Blues,” “Special Rider Blues,” “The Pony Blues,” and “The Jinx Blues” for the Library of Congress in the legendary “Field Recordings of 1941 – 1942″. Then, in 1943, he left the Delta for good. Unlike Muddy Waters, who made his way to Chicago in search of fame and fortune, House’s chief motivation in leaving the Delta was to escape the hardships of life in Mississippi. Alone again, he took the train to Rochester, NY, and landed himself a job with the train line. When Willie Brown died in 1952, House said “Well, sir, all my boys are gone.” and stopped playing altogether. He later said, “I don’t even know what I did with my guitar.” House abandoned the blues and joined the Amen Baptist Church. About a decade later, he was located by a pair of blues devotees and they coaxed him out of retirement in 1964. House signed with Columbia Records and resurrected his signature tunes. He performed at blues festivals, colleges, and other concerts which took him all the way to Europe. Through all the acclaim, he remained a soft-spoken, modest man who depended on the bottle to calm his nerves. By 1976, deteriorating health forced his ultimate retirement. Son House moved to Detroit to be with family and died in his sleep on October, 19, 1988. With his passing went the last of the great original Mississippi Delta blues singers.Truly a remarkable story about the birth of a legend and the Delta Blues. This is House’s acapella classic “Grinnin’ In Your Face”. It embodies everything that is Son House and there isn’t even any guitar. For that matter, it embodies everything that is soul music as we know it. There are numerous imperfections, including some off beat clapping, but you can feel the passion in every lyric. This is a really cool old live performance captured in his later years of another classic, “Death Letter”. Finally, here is a live duet form 1968 with a very young Buddy Guy. They are playing one of House’s most famous tunes, “My Black Mama”. Coming from where we are today, Son House’s playing technique and overall approach to the instrument was very unique. Son played various steel bodied Dobro-style guitars, playing slide with just an old piece of copper tube on his third finger. By using his third finger, Son was able to dampen behind the slide and still use his pinky for fretting. The copper tube adds a really gritty sound, which works great with his steel bodied guitar. What is especially odd about his approach is that he used “Spanish” tuning or Open G, tuned as DGDGBD. It’s pretty uncommon these days and would vastly change the way one plays. As I mentioned, there are numerous artists influenced by House. Jack White is one of the most popular in this day and age. Here is Jack and Meg (The White Stripes) playing a live medley of “Death Letter” & “Grinnin’ In Your Face”. Jack has gone on record saying that “Grinnin’ In Your Face” is his favorite and perhaps most influential song he’s ever heard. Here is Warren Haynes with Gov’t Mule also doing Grinnin‘. Andrew Bird with his version of Grinnin‘.